According to Daniel Norris, one of the biggest differences between Major and Minor League pitchers is the former's ability to make adjustments pitch by pitch. If that's true, then the Blue Jays' No. 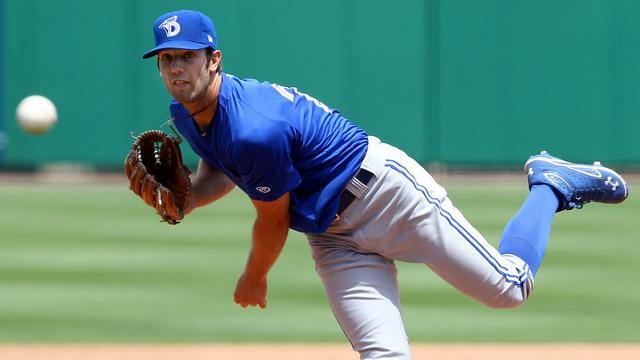 4 prospect took a step closer to the big leagues Saturday as he allowed four hits over six scoreless innings in Class A Advanced Dunedin's 4-2 win over Brevard County. "Tonight, I grew a lot as a pitcher. Wasn't sharp, but I made the adjustments," said Norris, who walked one batter and struck out six. "My fastball wasn't really where it usually is, it was not where it needed to be, command-wise, so it was nice to have three other pitches to rely on. But after a few innings, my command got better." Norris -- who turns 21 on April 25 -- allowed the leadoff hitter to reach in four of his six frames. Each time, however, he made the adjustments between at-bats and worked his way out of trouble. The left-hander remembers struggling to make adjustments as a high school pitcher, so it's been something he continues to work on -- along with his athleticism -- with his coaches and teammates in the Minors. "I've been working my tail off. Every time I throw a baseball, I try to focus on how it comes out of my hand," he said. "If it's not where it should be, how do I get it to be where it should be? "Going into [the offseason], I said I just want to be best athlete on the mound; I pride myself on my athleticism. The more athletic I can be on the mound, the more I can repeat my delivery, which is very important." Including one start last season, the 2011 second-round pick has allowed one run on 10 hits over 16 innings in three Florida State League starts. After recording only two wins in 23 starts last season between Class A Lansing and Dunedin, Norris (2-0) has learned how much being on a winning team is important to his own progression. And with the "positive" and "super mellow" energy this year, Norris thinks the D-Jays clubhouse is a great place to be. Arik Sikula grabbed a share of the FSL lead with his third save after allowing a hit and a walk over 1 1/3 scoreless innings. "He's a gamer, he's a bulldog," Norris said. "We're roommates; we just stay up talking about pitching [and] he's going to tell me straight-up when I do bad." Dunedin staked Norris to a 3-0 lead in the second as Emilio Guerrero delivered an RBI double, Matt Newman raced home on a wild pitch and Michael Reeves plated another run with a groundout. Brevard County climbed within 3-2 in the top of the seventh, but K.C. Hobson answered with a run-scoring single in the bottom half. Manatees starter Jorge Lopez (1-1) took the loss after allowing three runs on six hits with five strikeouts over six innings.